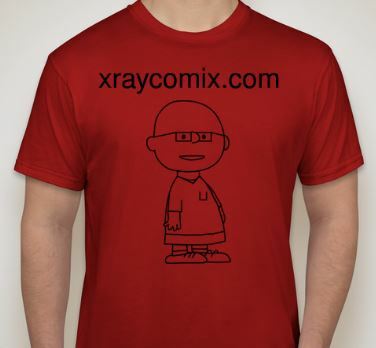 The xraycomix.com t-shirts have arrived and you, yes you can win one! Just be the first Emory SOM M2, M3, M4 or Emory radiology resident (i.e. one t-shirt per group) to answer 3 questions about the site and you will go home with one of the beauties below. See you at 6 am tomorrow, when my next comic posts and at noon when the contest questions post. Thank you sweet wife for catching the 2 3 spelling errors in this post!